Our athletes often ask us how to use heart rates in training. I was ready to write a quick article explaining how heart rate zones work but then I changed my mind as I believe that heart rate zones are not always the best option and should be used in conjunction with other zone indicators. 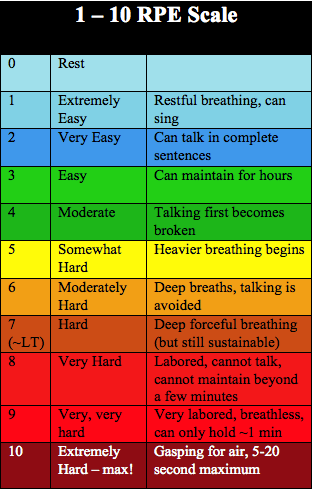 Saying that, heart rates zones is a not a bad guide to help you determine your pace for a training session designed to be in a certain “zone” for running and cycling. By maintaining your heart rate within certain parameters, you can target session goals and be reasonably confident you are on the mark. For example an aerobic long run is normally at zone 2 or below. Maintaining your heartrate below the zone 2 limit indicates that you have met your goal for an aerobic session. There are different methods for setting zones. Some people prefer the method of using % of maximum heart rate. Jack Daniels, running guru, suggests this as a method in his book “The running formula”. 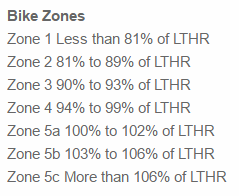 Joe Friel, as an alternative, uses % of HR lactate threshold as a method for setting zones. Lactate threshold is the tipping point, where your body can still produce enough oxygen to use the lactate in your system, lactate being an alternative energy source for your body. At a higher heartrate, you can no longer obtain enough oxygen to keep up with lactate production and in order to clear lactate from your body, you need to slow down or stop. The limitation I find with using the HR zone method to set your pace at in training is that if you are, for example, running 4-5 threshold intervals at HR zone 4, then it is going to take some time to get your heart rate up into the zone 4 area when you begin the session. You are likely to run extra hard in the first couple of intervals to get your heart rate up to zone 4, quickly. The issue with this is that your first couple of intervals are going to be extra fast but the last 3 intervals are likely to suffer because you have spent all your energy going too hard early in the session. Quality, therefore decreases as the session goes on. My preferred approach with my athletes is to use pace zones in conjunction with HR in running and RPE in conjunction with HR with cycling. 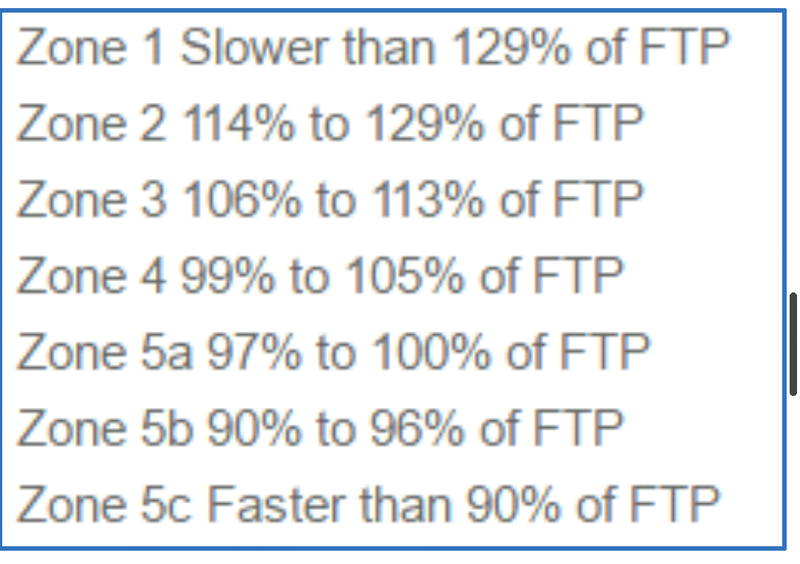 Pace zones can also be calculated using the Joe Friel method, where FTP is the functional threshold pace. We will come to how we obtain both the LTHR and the FTP shortly. 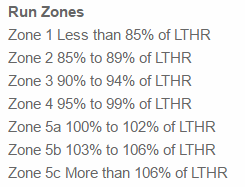 HR zones and pace zones need to be tested fairly regularly. Joe Friel suggests, as does most adaptation models that this should be every 4-6 weeks. RPE or rate of perceived exertion is a subjective measure based on an individual’s perception of the effort they are making. The scales will vary where you look on the net but I tend to use 3 for aerobic, 5-6 for tempo efforts, 7 for threshold and anything above that is just hard for varying length of time. So how do we test for threshold HR/pace? This is the test I give to my athletes. 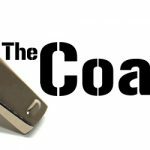 It is pretty standard, you will notice that it is what Joe Friel uses in his quick guide. Once the time trial is over cool down and stretch as normal. Once the time trial is over cool down as normal. 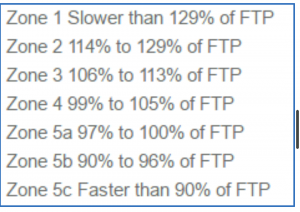 The Functional threshold pace is the average pace for the whole 30 minutes of the test. Alternatively, Jack Daniels, has a great calculator which you can use for calculating your threshold pace. This can be used for any run at race pace, including the time trial I just described. It does vary marginally from the Joe Friel test. I find the Jack Daniels test gives a more accurate threshold pace indicator as fitness levels/speed plateau and for those that have a threshold quicker than 5 minute/km pace. Once you have your threshold HR and pace data, you can set up your zones using the Joe Friel method. You can then start planning your sessions, incorporating zones into your workouts so that you can have set sessions that target certain zones. Don’t forget to test regularly, not only to reset your zones but to check how your fitness has improved..
My advice is use pace and RPE but use HR rate as a guide to determine whether you are within a reasonable range of your goal session pacing.